New stealth game Styx: Shards of Darkness released on March 14 for PlayStation 4, Xbox One and PC releases its free demo on Steam today. This demo will also release Friday, June 9th on Xbox One, and Monday, June 12th on PlayStation 4. This demo allows you to sneak around on the tutorial level of the game. Welcome to Thoben the City of Thieves, where you have to help Styx hide, sneak, assassinate and steal the pays of the local guards, while getting a very first taste of the praised level design of game, new upgraded acrobatics, new gadgets and tools, and Styx' trademark attitude. Players can upgrade to the full game during or at the end of the demo to continue their adventure. The Steam version allows players to keep the saves made during this demo, to use them after their purchase the full game on Steam. For this occasion, Styx: Shards of Darkness will be available at 40% off until Monday, June 12. The Styx: Shards of Darkness free demo is now available on Steam. Game at 40% off until June 12. The free demo will also be available on Xbox One on June 9th, and June 12th on PlayStation 4. 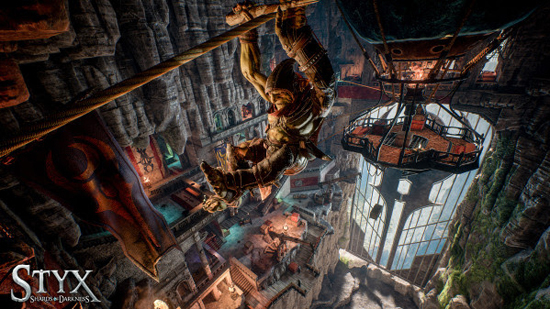 Following its positive reception from press and players, the centuries-old goblin assassin Styx returns in a new stealth game, Styx: Shards of Darkness, with a bigger budget, bigger ideas, and a new engine: Unreal 4. Master of Shadows was a valiant exploration into the world of the green goblin thief, but Shards of Darkness will delve deeper into a complex narrative and fully realized world. Following the fall of Akenash tower, an extraordinary matter has forced Styx out of hiding to infiltrate Körangar, the city of the Dark Elves. Supposedly impregnable, a diplomatic summit offers Styx a chance at slipping in unnoticed, as he learns that the event is nothing but a mere façade... Embark upon a stealthy adventure with new enemies, new environments, and a plethora of new mechanics aimed at refining the abilities and movement of Styx; grappling around corners, climbing ropes, and using his trusty knife as a zip-wire. Shards of Darkness aims to offer unparalleled freedom of movement, along with refined stealth and assassination mechanics, expanding and improving on the strengths of Styx: Master of Shadows. Styx: Shards of Darkness comes March 14th on PS4, Xbox One and PC.